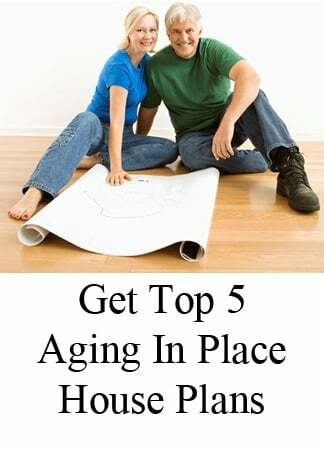 A careful use of space can open up any home to make it seem larger and more inviting. 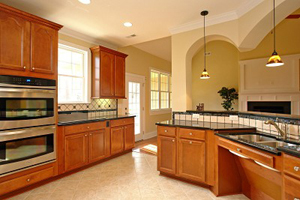 The addition of an Island in your Kitchen can be key to using square footage efficiently. 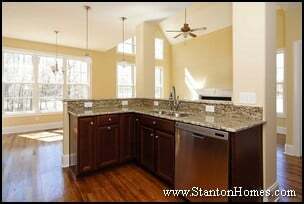 See photos of recently completed custom homes in the Raleigh area, with Island Kitchens that utilize space carefully. 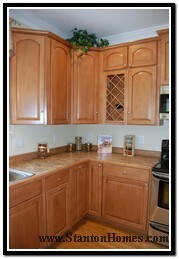 These Island Kitches open up to great rooms and breakfast nooks, add storage space, and include bar seating areas. 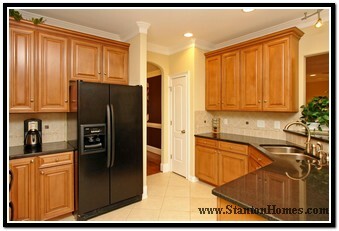 Learn about Kitchen Cabinet Options and Kitchen Tile Backsplashes. 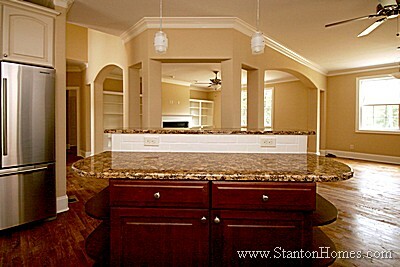 Stanton Homes Signature Gourmet Kitchens are designed to be the heart of your home. 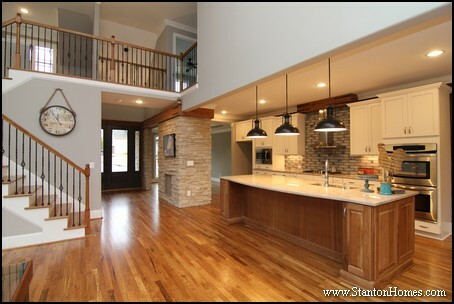 Far more special features come standard in a custom Stanton Home kitchen (varying by model and design) – like granite countertops, hardwood flooring, custom tile work, built-in storage, majestic archways – than you’ll find with any other builder in the region in our price range. If you’re thinking of building anywhere across the 13 counties in the greater Triangle area, let us know what "upgrades" you’d like most. You’ll be surprised at how many are already included. 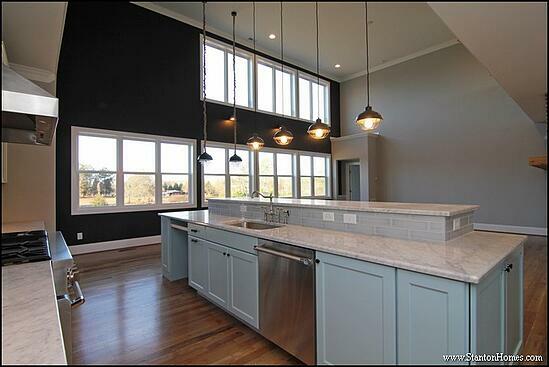 Chances are good you'll spend more time in the kitchen than anywhere else in your NC custom home. 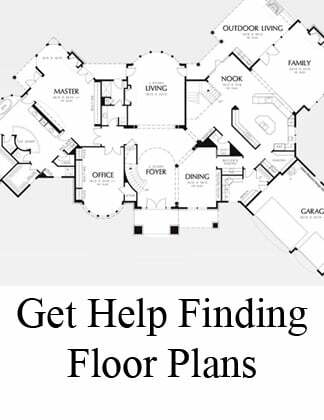 But have you really thought about the layout and design of your island countertop space? 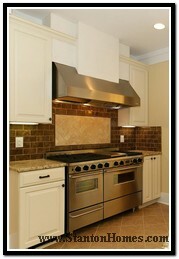 Will the island have a cooktop, wall oven, or microwave? 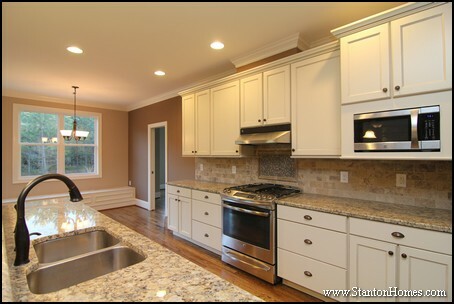 Will the island have a sink and dishwasher? Will the seating area be lower or higher than standard countertop height? 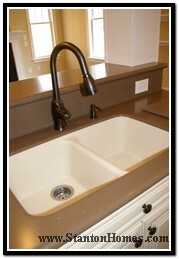 Should there be a prep sink? Will the peninsula have a cooktop, wall oven, or microwave? Will the peninsula have a sink and dishwasher? Should there be seating or a serving bar? Once you have an idea of what you'd like to see where in your new custom home kitchen, you'll want to ensure that the islands and peninsulas are functional. Islands and peninsulas should provide additional prep space, and should move traffic away from the traditional work triangle. 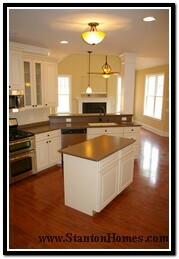 Does your island or peninsula have enough "floor space" around it for cooks and guests to move comfortably? Minimum 42" recommended around an island for one cook. Minimum 48" recommended around an island for two cooks. 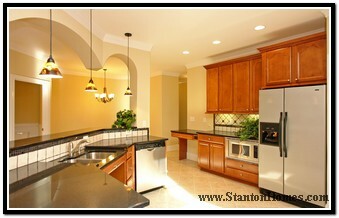 Measure between countertop fronts, as this is true space available. Minimum 44" recommended if this area is a passageway. 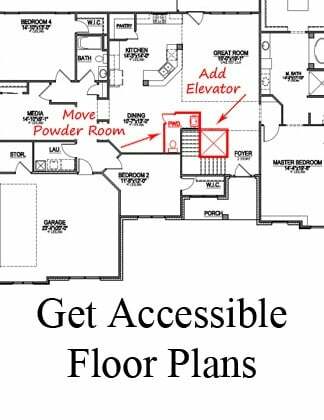 Minimum 60" recommended for wheelchair access. 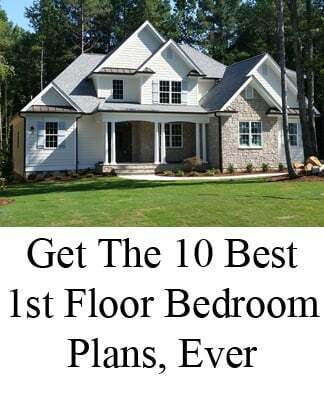 NC custom homes can be designed to your specifications, but make sure to ask your custom home builder for recommendations before finalizing the design. They've seen thousands of homes built, and might just have some terrific ideas for your new kitchen too!